Several key components combined to transport the tone of a priceless Stradivarius and the musicality of an acclaimed violin virtuoso to the KONTAKT Player platform, producing super-intuitive playability available to all who work with the resultant Joshua Bell Violin namesake plug-in instrument literally like no other in any AAX-, AU-, RTAS-, and VST-compatible host application or DAW (Digital Audio Workstation), with Grammy® Award-winning violin virtuoso Joshua Bell surely first in line to take a virtual bow. But Bell surely needs no introduction as one of today’s most celebrated violinists… but his lengthy list of achievements make for fascinating reading regardless. Restless curiosity, passion, and multi-faceted musical interests maketh the man — a recording and performing artist unparalleled in the classical music world. With more than 40 CDs of recorded classical repertoire to his notable name, alongside standout soundtracks such as the Oscar®-winning score for The Red Violin, he has been warmly embraced by wide-reaching television audiences with appearances ranging from The Tonight Show, Tavis Smiley, and Charlie Rose to CBS Sunday Morning and Sesame Street. Bell was one of the first classical artists to have a music video on VH1 and also the subject of a BBC Omnibus documentary. He has appeared in publications ranging from The Strad and Gramophone to Time, The New York Times, People Magazine (50 Most Beautiful People), USA Today, The Wall Street Journal, GQ, Vogue, and Reader’s Digest to name but a notable few. Furthermore, Bell regularly performs on the world’s most prestigious stages — from Carnegie Hall (33 times) to the Hollywood Bowl — with his 1713 Huberman Stradivarius violin and his late-18th Century French bow by François Tourte. The rest, as they say, is history, and Bell uses the historic instrument in question exclusively to this day! But better still, the fact that a musician of Bell’s pedigree plumped for creatively collaborating with Embertone — esteemed as they are in their chosen field of virtual instrument sampling — surely speaks volumes. Both teams met at Avatar Studios — a world-class recording studio complex (formerly known as The Power Station) — in Hell’s Kitchen, New York for two intense six-hour sessions over two days. During that time, Bell was rigorously recorded making more than 12,000 unique samples across a diverse set of articulations. Those two sessions were engineered by Richard King, himself a Grammy® Award-winning sound artist. Alex Davis and Jonathan Churchill — Embertone co-founders and instrument producers — sat in the room with Bell, holding their collective breath for the entirety of each session — hardly surprising, given that they had prepared 400-plus pages of score, and Bell had played every note on every page with astonishing artistry and energy. Embertone worked hard over the following year, harvesting each and every musical moment, refusing to waste any creative content. Clearly the result is an enormous treasure trove of inspired, expressive samples! Setting out to create a new standard in virtual solo strings, offering an abundance of flexibility without sacrificing inspiration — and all with the unmistakable, iconic sound of Joshua Bell himself, Embertone has achieved all that and more with Joshua Bell Violin. Indeed, it offers a huge variety of standard articulations — such as sustains, pizzicatos, staccatos, and spiccatos — alongside a number of sample sets unlikely to be found elsewhere besides… Bell recorded an amazing-sounding set of eerie harmonics transitions, for example, and also a set of super flautando, a special technique he can harness from his 300-plus-year-old violin. 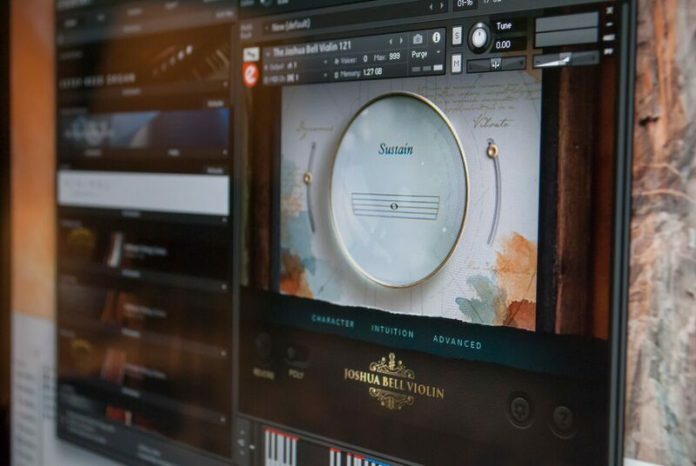 As an advanced virtual violin for Native Instruments’ industry-standard KONTAKT Player platform, Joshua Bell Violin is incredibly complex, featuring almost 20,000 individual samples. 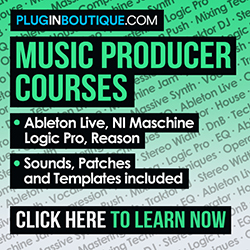 Yet it is designed to feel simple, thanks to the intelligent and predictive programming using a diverse array of musical properties and rule sets. And with 12 true legato/transition styles, Joshua Bell Violin allows users to play at various tempos, dynamics, and in different styles — all the while sounding authentic… akin to stepping into the shoes of one of the world’s greatest violinists and experiencing a priceless Stradivarius at their fingertips, courtesy of those thousands of rigorously-recorded samples perfectly performed by the virtuoso himself! Whether warranting marriage is open to question, but one thing’s for sure: Joshua Bell Violin is a musical match made in heaven for composers, hobbyists, musicians, and performers alike. Anyone adding it to their KONTAKT Player instrument collection will surely be far from disappointed that Embertone engaged with Grammy® Award-winning violin virtuoso Joshua Bell on this sampled virtual instrument namesake!